Given that this is the first puzzle in chapter 2, it is definitely a good warm up to the next few puzzles to come! I am still quite annoyed that the eruption destroyed nearly everything we created in chapter 1, but I'm sure that the village will look even more awesome than before! 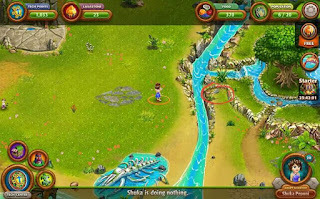 Drag adult villagers to use water to douse the fires on the buildings. You will need 4 water. Drag villagers to rebuild huts that were destroyed in the eruption. Finally the huge boulder beside the then green statue has some use! We can now make the wall behind it a mural, and it's pretty easy to complete albeit time consuming. This is another simple yet time consuming level. In fact, I think most puzzles in chapter 2 are simple and time consuming. Drag master builders to the rock debris above the previous kraken statue. Do this 5 times to fill the holes in the big boulder. Drag a master researcher to draw plans. Drag a master builder to the big boulder and he/she will make a mural. Craft paints (red, blue, green) and drag the master builder to the crafting hut paint the mural.